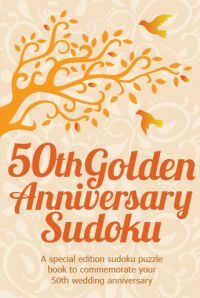 A special edition sudoku puzzle book to commemorate your 1st-9th, 10th, 15th, 20th, 25th (Silver), 30th, 35th, 40th (Ruby), 45th, 50th (Golden) & 55th wedding anniversary. What better way to congratulate your other half, loved one or friend than with this fabulous gift! 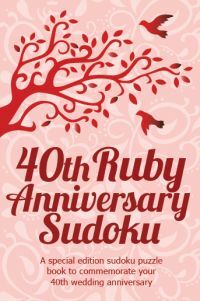 100 puzzles, complete with solutions are presented in this fun and unique book, which would make the perfect present for couples celebrating their anniversary. We currently have 19 editions available, each one uniquely created for 1st-9th, 10th, 15th, 20th, 25th, 30th, 35th, 40th, 45th, 50th & 50th anniversary's. 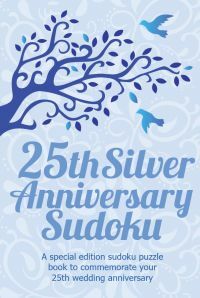 We hope you find the anniversary that you are looking for above. If not, then don't worry - just contact us with the number of the anniversary that you require, and we'll create the book for you. 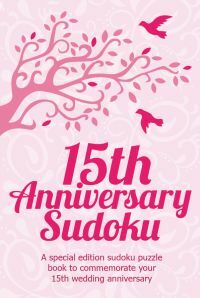 We've concentrated above on creating gift puzzle books for the most popular wedding anniversaries, but we are happy to make one for the date you need, whether it's the 11th wedding anniversary or the 64th! Best of all, we'll arrange for it to be created and listed at the same price as all the other anniversary books in this collection, so you can have a truly bespoke gift created and it won't cost the earth to do so. 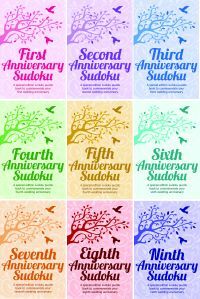 Note that you can also choose the colour of the cover for a bespoke anniversary sudoku book created. For an idea of existing colours, then take a look at the menu to the right of this page. Note however that we are unable to use colour on the inside of the book due to price - it makes the product much more expensive to create and therefore greatly ups the price of the product. For those looking for a truly special gift, then we can arrange for the cover to be printed with the name of the couple that you wish to give the gift to - for instance "Happy Golden Anniversary to Julie and Christian Edwards". This can also be included on the introductory page of the book. However, these are by their nature one-off gifts and therefore the price for these gifts regrettably has to be considerably more to cater for their uniqueness. If you are interested in a quote for one of these highly personalised gifts, then please do contact us with what you have in mind and we'll be pleased to send you a quote for its production.